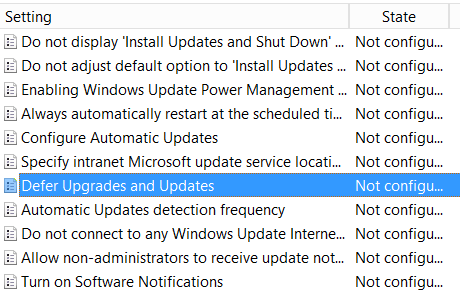 If you have deployed Windows 10 to your organisation then you might be familiar with the new Group Policy setting that allowed you to defer the upgrade of Windows 10. 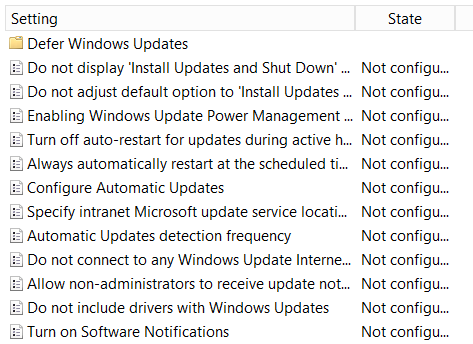 These policy setting also know as “Windows Update for Business” allows you to delay by up to 8 months the OS upgrade that Microsoft delivers to you via Windows Update (see below). 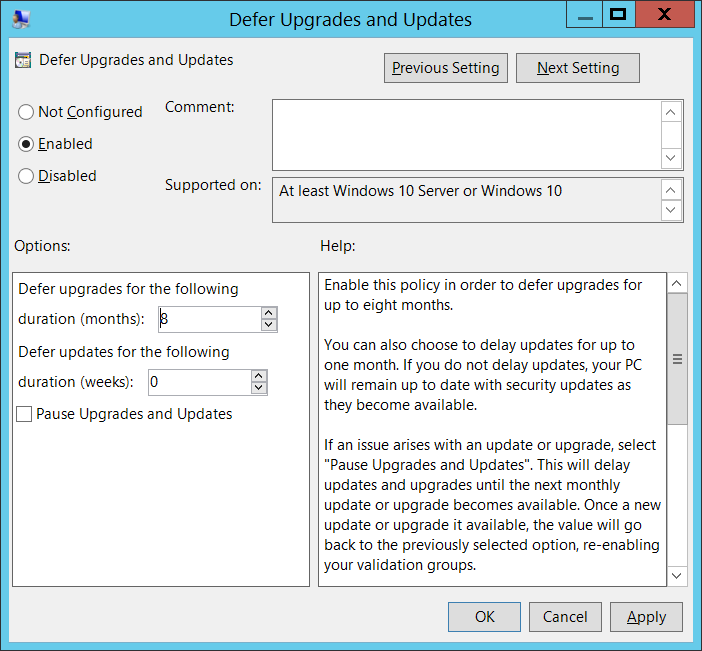 However, with the release of Windows 10 1607 the Group Policy setting “Defer Upgrade and Updates” has been completely removed and replaced by new policy settings under “Windows Update>Defer Windows Updates” (see below). 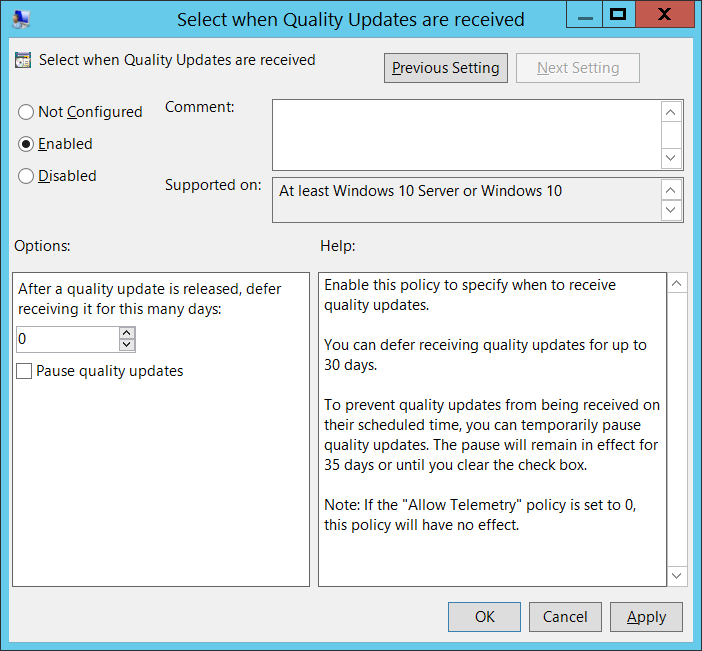 The two new policy settings called “Select when Feature Update are received” and “Select when Quality Update are received” (see below). NOTE: Some times when Microsoft release a new OS they might rename the GPO setting but still keep the underlying Registry Key the same. 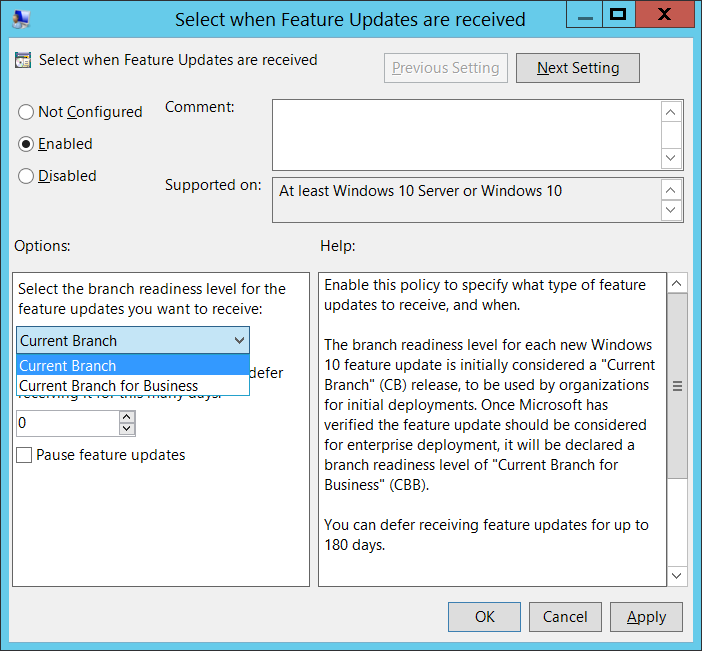 This means that the name of the policy setting has changed but the actually setting is preserved when upgrading. But this is *NOT* the case. 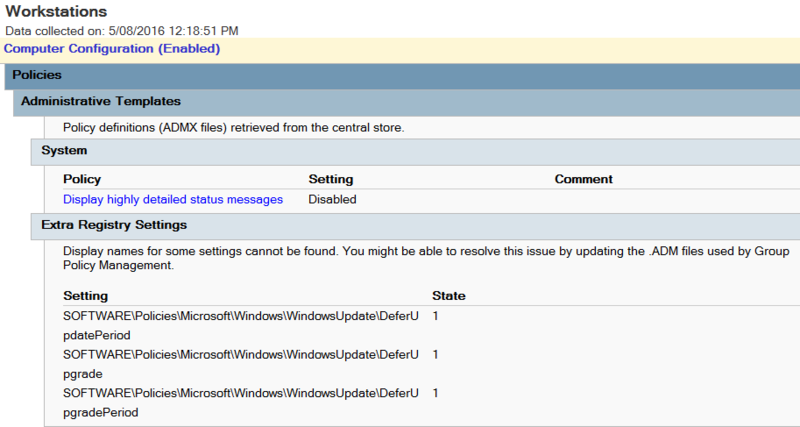 Therefore, you might want to go back to your ADMX Group Policy Central store de-configure the “Defer Upgrades and Update” GPO setting before upgrade the policy files. Alternatively, you could just leave the policy setting configured and do the ADMX upgrade and just live with the “Extra Registry Settings” message in GPMC (See below). Note: This policy will still apply with the “Extra Registry Settings” will still apply to the Windows 10 1511 build. Then at a later stage once all your Windows 10 1511 computer have upgrade to 1607 you can either quickly swap the “WindowsUpdate.admx” and “WindowsUpdate.adml” in the central store and then just de-configure the policy setting to clear the above “Extra Registry Settings” message from the policy. Pye Phyoe Aung liked this on Facebook. Jürgen Je liked this on Facebook. Ahmad Abbas liked this on Facebook. Hem Loeurt liked this on Facebook. Alon Avidor liked this on Facebook. ທ.ວິໄລ ໄຊຍະວົງ liked this on Facebook. Bigky Khamhongsa liked this on Facebook. have i to wait until all the clients update the policy from the central server? before replacing the admx with the 1607 version again?